Stool features a padded seat and back for added comfort. Angled seat makes sitting down and getting up easy. Manufactured with white powder coated steel for an attractive,durable finish. Legs are chrome plated steel. 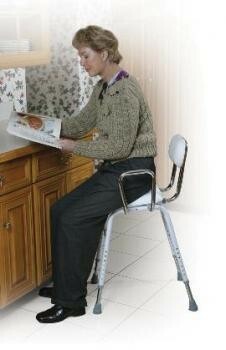 Comes with removable arm supports with adjustable width for added safety and comfort. Adjustable height to accommodate most individuals.